Gladiators (Latin gladiatores) were professional fighters in ancient Rome who fought against each other, wild animals, and slaves, sometimes to the death, for the entertainment of spectators. These fights took place in arenas in many cities during the Roman republic and the Roman Empire.The word comes from gladius, the Latin word for a short sword used by legionaries and some gladiators. The gladiatorial games were originally established by the Etruscans, but were later adopted by the Roman as a means of entertainment. The Etruscans believed when an important man died his spirit needed a blood sacrifice to survive in the after life (Nardo, Games of 21). The first recorded gladiatorial combats took place in Rome in 264 BC. Decimus Junius Brutus Scaeva staged it in honor of his dead father. It was held between three pairs of slaves, and held in the Forum Boarium. The ceremony was called a munus or ³duty paid to a dead ancestor by his descendants, with the attention of keeping alive his memory. These were held for notable people and were repeated every one to five years after the person's death. Public spectacles (called munera, singular munus) took place in amphitheatres (like the Colosseum) and took the latter half of the day after the fights against animals (venationes) and public executions of criminals (noxii). Initially rich private individuals organized these, often to gain political favor with the public. The person who organized the show was called the editor, munerator, or dominus and he was honored with the official signs of a magistrate. Later the emperors would exert a near complete monopoly on staging public entertainment which included chariot racing in the circus (ludi circenses), hunts of wild animals, public executions, theatrical performances (ludi scaenici) and gladiator fights. There was usually musical accompaniment.Gladiators were typically picked from prisoners of war, slaves, and sentenced criminals. There were also occasional volunteers. They were trained in special gladiator schools (ludi). One of the largest schools was in Ravenna. There were four schools in Rome itself, the largest of which was called the Ludus Magnus. The Ludus Magnus was connected to the Colosseum by an underground tunnel. Gladiators often belonged to a troupe (familia) that traveled from town to town. A trainer of gladiators or the manager of a team of gladiators was known as a lanista. The troupe's owner rented gladiators to whomever wanted to stage games. A gladiator would typically fight no more than three times per year.It should be noted that fights were not generally to the death during the Republic, although gladiators were still killed or maimed accidentally. Gladiators could be also the property of a wealthy individual who would hire lanistae to train them. Several senators and emperors had their own favorites. Criminals were either expected to die within a year (ad gladium) or might earn their release after three years (ad ludum) - if they survived. Different gladiators specialized in different weapons, and it was popular to pair off combatants with widely different equipment. Gladiators usually fought in pairs (Ordinarii), that is, one gladiator against another. However, sponsor or audience could request other combinations like several gladiators fighting together (Catervarii) or specific gladiators against each other even from outside the established troupe (Postulaticii). Sometimes a lanista had to rely on substitutes (supposititii) if the requested gladiator was already dead or incapacitated. The Emperor could have his own gladiators (Fiscales).At the end of a fight, when one gladiator acknowledged defeat by raising a finger, the audience could decide whether the loser should live or die. It is known that the audience (or sponsor or emperor) pointed their thumbs a certain way if they wanted the loser to be killed, but it is not clear which way they pointed. It is possible that they pointed their thumbs upwards if they wanted the loser to live, and downwards if they wanted him to die; or, they may have done the opposite, pointing downwards if they wanted the gladiator to live. Another possibility is that they raised their fist but kept their thumb inside it if they wanted the loser to live, and pointed down to signify death. 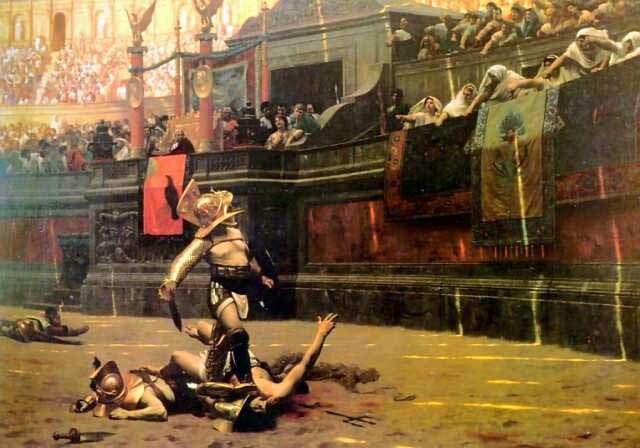 A gladiator did not have to die after every match - if the audience felt both men fought admirably, they would likely want both to live and fight for their amusement in the future. A gladiator who won several fights was allowed to retire, often to train other fighters. Gladiators who managed to win their freedom - often by request of the audience or sponsor - were given a wooden sword as a memento. The attitude of Romans towards the gladiators was ambivalent: on the one hand they were considered as lower than slaves, but on the other hand some successful gladiators rose to celebrity status. There was even a belief that nine eaten gladiator livers were a cure for epilepsy. Gladiators often developed large followings of women, who apparently saw them as sexual objects. This may be one reason that many types of gladiators fought bare-chested. It was socially unacceptable for citizen women to have sexual contact with a gladiator. Faustina, the mother of the emperor Commodus, was said to have conceived Commodus with a gladiator, but Commodus likely invented this story himself. Despite or because of the prohibition many rich women sought intimate contact with gladiators. They were the ancient Pop stars and the festivity before the fights gave the women an opportunity to meet them. Despite the extreme dangers and hardships of the profession, some gladiators were volunteers (called auctorati) who fought for money; effectively this career was a sort of last chance for people who had gotten into financial troubles. Their oath (which Seneca describes as particularly shameful) implied their acceptance of slave status and of the worst public consideration (infamia). More famous is their phrase to the emperor or sponsor before the fight: Nos morituri te salutamus ("We who are about to die salute you").Some emperors, among them Hadrian, Caligula, Titus and Commodus also entered the arena for (presumably) fictitious or rigged combats. Emperor Trajan organized as many as 5000 gladiator fighting pairs. Gladiator contests could take months to complete.Gaius Marius had gladiators train the legionaries in single combat. Female gladiators also existed; The Emperor Domitian liked to stage torchlit fights between dwarfs and women, according to Suetonius in "The Twelve Caesars".One of the most famous gladiators was Spartacus who became the leader of a group of escaped gladiators and slaves. His revolt, which began in 73 BC, was crushed by Marcus Licinius Crassus two years later. After this, gladiators were deported from Rome and other cities during times of social disturbances, for fear that they might organize and rebel again. The Greek physician Galen worked for a while as a gladiator's physician in Pergamon.Gladiator fights were first outlawed by Constantine I in 325 but continued sporadically until about 450. The last known gladiator competition in the city of Rome occurred on January 1, 404. Roman Games (Field & Track) In the city, there was a place called the Campus. This was the old drill ground for soldiers. It was a large section of plain near the Tiber River. Over time, the Campus became ancient Rome's field and track playground. Even such famous people as Caesar and Augustus exercised on the Campus. Young men, all over Rome, gathered at the Campus to play and exercise. On the Campus, men participated in foot racing, jumping, archery, wrestling and boxing. After a bout of exercise, they might jump in the Tiber River for a swim, or wander off to the Baths, to relax. All over Rome, men practiced riding, fencing, wrestling, throwing, and swimming. In the country, men went hunting and fishing. At home, men played ball before dinner, which were games of throwing and catching. Women were not allowed to join in these games. 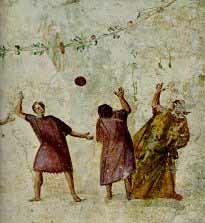 Ball-playing was popular among the Romans, and they often spent their morning exercises playing games on the fields (palaestra) or ball-courts (sphaerista). The Romans enjoyed a variety of ball games, including Handball (Expulsim Ludere), Trigon, Soccer, Field Hockey, Harpasta, Phaininda, Episkyros, and certainly Catch and other games that children might invent, like Dodge Ball. An additional game called Roman Ball is theorized to fill some gaps. The pages linked on the right provide descriptions of these games. Soccer is a natural game and although the Romans may not have played team soccer there are references to boys kicking balls around in the streets. Cicero described one court case in which a man getting a shave was killed when a ball was kicked into the barber. The ball must have been an inflated pila. The mosaic from Ostia, above, shows what appears to be an inflated pila, stitched in the fashion of modern soccer balls. Considering that this scene represents a gym, it might be also a paganica, or medicine ball, but paganicas are always shown as oblong.